Welcome to Bluefield Yarn Company! 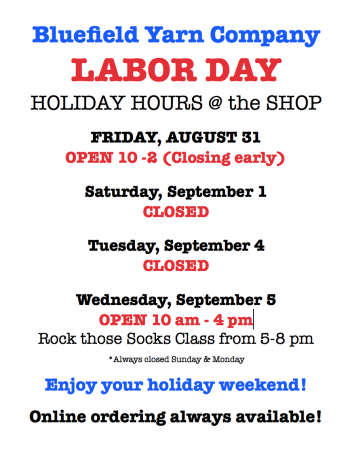 Just a friendly reminder about holiday hours for the Labor Day Weekend! Wishing you a relaxing & enjoyable holiday weekend! Did you know that you can order online 24/7/365? If you are local you have the option of using in store pickup! Keep in touch with us by visiting our website and check out the CALENDAR for the latest events at Bluefield Yarn Company! Don't forget to register for the ROCK THOSE SOCKS Class! First Class begins September 5! Click here for complete information and registration!